Many people today are looking for affordable home options that offer amenities and style while not costing a fortune. As a result, modular and manufactured homes have become a popular option in today's real estate market. In order to help you understand the differences between the two, we have answered some of the more common questions about modular and manufactured homes as well as a brief explanation of what the differences are between the different types of houses available. Manufactured Home - aka - "Mobile Home"
First of all, forget the term “mobile home” – they’re now called “manufactured” homes. The old rectangular shoe-boxes you used to see (and still do) packed together along the highway have been replaced by 2,500-square-foot structures with sun rooms and decks. 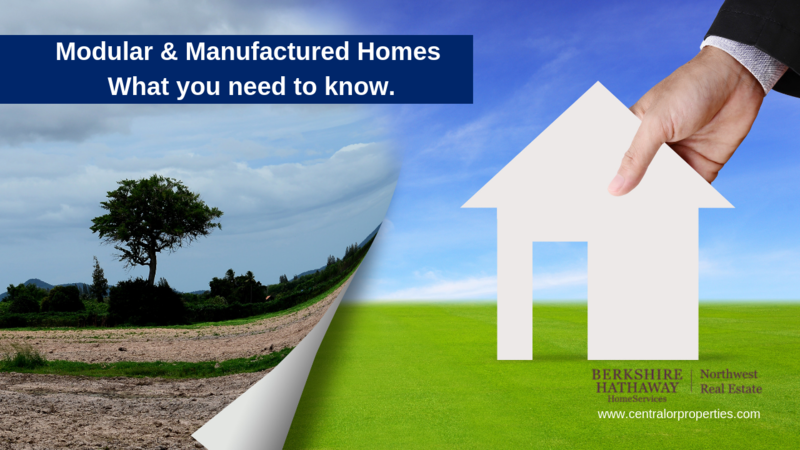 The Manufactured Housing Institute defines a manufactured home as "a single-family house constructed entirely in a controlled factory environment, built to the federal Manufactured Home Construction and Safety Standards, better known as the HUD Code." Most people still refer to them as mobile homes, but the MHI says that "mobile home" is the term used for homes built prior to June 15, 1976, when the HUD Code went into effect. The U.S. Department of Housing and Urban Development, to further clarify, defines a manufactured home as a dwelling that contains at least 320 square feet with a permanent chassis for transportability (or “mobility”) of the home. These homes are constructed according to Federal code that applies nationwide. Thanks to the uniform code, these structures are thoroughly inspected at the factory and have to pass muster. Most manufactured homes are sold through retailers. Do Manufactured Homes need a lot of maintenance? All homes require maintenance, how much is determined by where you live, weather and how you care for your home. Just like a stick built homes, a manufactured home will eventually need to be painted or the roof replaced. Manufactured homes can also be remodeled. Fact: Twenty-five percent of new residential construction and home sales annually in the U.S. are manufactured homes. One reason: this is the lowest cost stand-alone residence available. According to the Manufacturing Housing Institute, you can purchase a brand-new manufactured home for an average price of $70,600 (not including land). And manufactured homes are losing their stigma thanks to the new design options – in other words, mobile homes have lost their boxy look. There are a few drawbacks, of course. One is that many communities do not allow manufactured homes (the old stigma rearing its ugly head) and another is potentially costly insurance. This is thanks to the perceived risks to manufactured homes. Insurance costs are based primarily on exposure to risk, and statistically, according to insurers, manufactured homes are the riskiest types of homes. Take weather damage, for example. Manufactured homes are less able to sustain high wind because they’re lighter than stick-built homes and easier to blow over. And while manufactured homes are not more likely to catch fire, they are more likely to suffer damage from frozen pipes because the walls are often not as well insulated. Note: In high wind areas, many manufactured homes can be placed on permanent foundations and install foundation tie downs to reduce the risk of wind damage. Frozen pipes can be protected by installing additional insulation under the home and around the pipes. Financing Manufactured Homes - most Banks and Mortgage Companies offer traditional 30 year (or less) home mortgage financing available for existing manufactured homes on land purchases. However, if you are looking to finance a new manufactured home that you plan on placing in a trailer park you may have the option of financing a manufactured Home as personal property. For those wanting to place a new manufactured home on a lot, choosing a land- and-home finance package may be the way to go. One word of caution when considering a purchase of older manufactured homes (15 years or older) or a manufactured home that has been moved more than once. You may have problems finding a mortgage for this type of home. If the manufactured home falls into this category be sure to consult your Realtor or mortgage professional to find out your options before making an offer. And now for a look at the new kid on the block, modular housing. Most people have a hazy-at-best idea of modular homes – are they made of molded plastic? Are the rooms ultra-modern pods, or what? No, and no. Once built, they are virtually indistinguishable from traditional site-built homes. Modular Homes can be less expensive than stick built homes if a standard floor plan and design are chosen. Just like stick built homes, costs can increase due to customization or added costs to prepare the building site. Modular housing may be the wave of the future. It accounts for 60 percent of all residences in Sweden and 30 percent in Japan. Modulars work well for people who want to build in remote locations and rural areas, and unlike site-built homes, they cut waste and environmental impacts. Do Modular Homes hold their value? Modular homes are considered the same as stick built homes when it comes to appraised value. Provided that the home is maintained, there is no reason to think it would not hold its value and appreciate at the same rate as a neighboring stick built home of similar square footage and amenities. Financing - most of the time, modular homes qualify for traditional mortgages because they are usually part of a land and home purchase like site-built homes. Construction loans are usually available as well since a foundation is poured and permits are pulled for the home.